Kensington Union Bay Properties Limited recently held a press conference to announce the launch of the Union Bay Estates development – a residential and commercial development located on 850 acres in Union Bay, in the Comox Valley on Vancouver Island. The Master Development Agreement for this project allows up to 2,949 new residential units to be built. Currently, there are approximately 1,200 residents in Union Bay and the population could increase by an additional 7,500-9,000 once the project has been built out. Traveling to Vancouver Island as a tourist typically means taking in the ocean air at one of the many beaches or beach resorts, hiking along forest trails or mountain peaks, biking, paddling, golfing or taking on any number of active adventures. With world class spas and restaurants, finding time to relax is easy. The natural beauty – combined with a mild climate year-round, friendly towns and multiple recreating activities – is also turning many tourists into full time residents! Watch some video highlights here. The Calgary Herald heard that many new Comox Valley residents were attracted to the area because of the active, outdoor lifestyle, including surfing, paddle boarding or fishing on the lake or ocean, rock climbing, or skiing at Mount Washington. The Ridge is a new residential development in the City of Courtenay, in the Comox Valley on the east coast of Vancouver Island. Riverside Senior Living, a locally and independently owned Vancouver Island Retirement Community is opening in Spring 2018 in downtown Courtenay. Situated along the Courtenay Riverwalk, adjacent to the Best Western Westerly Hotel, these new retirement living suites offer a choice between 320 sq ft studio units and 640 sq ft one bedroom spaces. The suites all feature kitchenettes with full size refrigerators. The show suite at Riverside Senior Living in Courtenay is now open for viewing. Book a tour today and learn about the amenities and services of the Comox Valley’s newest seniors’ independent living community. All of these Vancouver Island retirement living units come with a host of amenities included in the monthly fee which includes: heat, hydro and basic cable, housekeeping; three prepared meals daily; social areas including a media lounge, fitness facility, indoor pool, games room; three onsite dining options; and a variety of scheduled activities. At Riverside Senior Living, the downtown Courtenay location means you are only steps from amenities including: grocery, pharmacy and other retails services; restaurants and entertainment; and the green space provided by the Courtenay Riverwalk. Many of the suites also feature beautiful views of the Courtenay River. Riverside Senior Living is set to welcome its first residents in Spring 2018. Tour their show suite today and learn about the amenities and activities they offer. To book a tour, call 250.331.4010 or visit RiversideSeniorLiving.ca to learn more. Building a new home in the Comox Valley? Thinking of inviting in-laws, elderly parents, or adult children to live with you, but have privacy concerns? Would rental revenue help you pay off your mortgage sooner? If so, then you need to look at The Ridge in South Courtenay, a new subdivision on Vancouver Island. Flexible zoning at The Ridge gives buyers the versatility of adding a secondary suite, carriage home, or workshop. When you choose to build your new custom home at The Ridge, you have a fantastic opportunity to add a secondary suite, workshop, or hobby room. These secondary suites are perfect for embracing extended family, such as in-laws, elderly parents, or adult children, while preserving privacy for you and your tenants. A carriage home is another option when you choose to build at The Ridge. Carriage homes are completely detached from the principal dwelling and can house a family member or tenant. They’re self-contained units with a bathroom, bedroom, and kitchen. Carriage homes can also be rented to earn additional income and pay off your mortgage sooner rather than later. Located on Buckstone Road, near Comox Logging Road and Fraser Road, The Ridge is just minutes from downtown Courtenay, shopping, restaurants, Crown Isle Resort & Golf Community, Mount Washington, and the Comox Airport. This picturesque 77-acre subdivision will be built in five phases and will incorporate expansive walking trails into the community. Select lots at The Ridge feature panoramic ocean and mountain views, with lot prices starting at $169,900. Preferred builders include Lawmar Contracting and Brando Construction. For more information on building at The Ridge, email Bruce Clapham at theridge.bruce@mail.com or phone 250.650.8588. The Vancouver Island waterfront vacation homes at Reef Point Cottages provide a wonderful Ucluelet real estate opportunity for those who want to explore the natural landscape of Ucluelet and Tofino. The resort currently has a private waterfront cottage for sale: a low-maintenance 956 square-foot home with two bedrooms and two bathrooms. This property offers excellent rental revenue opportunities within the Reef Point Cottages resort area. Luxury touches in this beautiful waterfront home include teak, marble, and slate flooring; granite countertops; and pine wainscotting and ceilings. Curl up by the fireplace on stormy nights or bask in your private hot tub on the oversized covered deck overlooking Spring Cove. Unit 273 is competitively priced at $279,000. Just 26 miles from Victoria, BC, you’ll find one of the finest waterfront real estate developments on Vancouver Island. Silver Spray, in the community of Sooke, is a 174-acre seaside development with an exceptional selection of new oceanfront homes and residential view lots. Coming soon to Silver Spray is SookePoint, a new oceanfront private residence club. SookePoint offers affordable waterfront luxury unlike anywhere else on Vancouver Island, with brand new turnkey oceanfront cottages, fully furnished, starting in the $300,000s. These new Vancouver Island waterfront homes near Victoria are perfectly positioned to view pods of orcas, dolphins, sea lions, eagles, otters, and more. Glass walls and decks provide uninterrupted views of awe-inspiring sunrises and majestic Vancouver Island sunsets. At SookePoint, you can stay as little or as long as you like: zoning allows for year-round living, vacation getaways, or rental revenue. 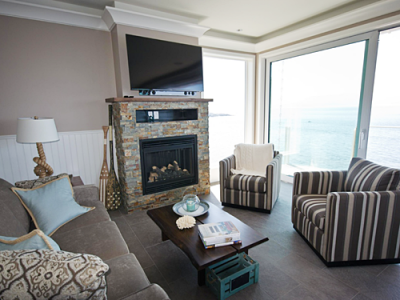 All SookePoint cottages feature panoramic waterfront views and are nestled among natural rock outcroppings, perched safely above the surging Vancouver Island surf below. Exteriors feature stone accents, privacy trellises, lush landscaping, and oversize walls of glass overlooking the ever-changing ocean. Come to Silver Spray – Victoria’s cottage country – and discover your nature. For a quick glimpse into what SookePoint has to offer, watch the SookePoint adventure video or visit their website. If you want to build your own new custom home on southern Vancouver Island and are in the market for a spectacular oceanfront or ocean view lot, visit Silver Spray’s website or call Jason at 1.778.896.3370.